Imagining Beethoven’s Diabelli Variations as a musical time machine, the Diabelli Machines research project exposes productive tensions between Beethoven’s own time, its past, and its future. Beethoven’s original work was composed in two periods: the first draft (1819) included twenty-three variations, while the final version (1823) took the total to thirty-three variations. In the final version, Beethoven included many musical parodies, alluding to Bach, Handel, Mozart, Haydn, and Cramer. Diabelli Machines makes these past references audible to listeners, and adds future compositions, in the form of new pieces reflecting on the Diabelli Variations. Diabelli Machines8 contains a CD, a DVD, and a written essay. The CD presents six new pieces, which were composed in response to specific variations from Beethoven’s original work, and the first ever recording of the 1819 version of the Diabelli Variations. 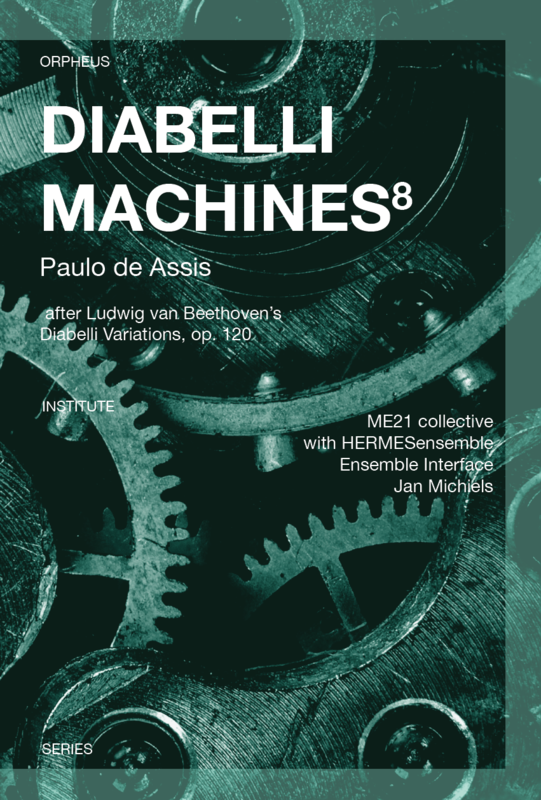 The DVD documents a live performance of Diabelli Machines in which the time machine is staged through conventional piano performance, transcriptions of the original variations for ensemble, and contemporary pieces. And the comprehensive new essay provides detailed insight into the ideas behind this project and its wider implications for future experimental performance practices of Western notated art music. Recorded at the Orpheus Institute, Ghent, Belgium, 20–22 January 2017 (tracks 1–8) and 9 December 2017 (track 9). Sound engineer: Juan Parra Cancino. Recorded at De Bijloke, Ghent, Belgium, 9 November 2015. Video recording: Thomas Heiber and Gerhard Schabel.